Of course, Rainbow Rabbit doesn’t wish to compete with a fellow rabbit of any kind. While he did help save the holiday and was in charge of leading the Easter Parade, the two aren’t even considered rivals, as Rainbow Rabbit is a friend to all! He treats everybody the same and wouldn’t have it any other way. Both rabbits are great at what they do best, and Rainbow Rabbit’s coat is as colorful as ever on this Sunday of the resurrection of Jesus Christ, which is celebrated all around the world. 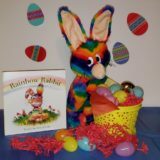 Bring Rainbow Rabbit Home On This Holiday! That being said, this day isn’t just another ordinary day for our friend, and for those of you celebrating the holiday this weekend, Rainbow Rabbit hopes your day is filled with many moments of peace and happiness! From all of us at Rainbow Rabbit, we hope you enjoy this special day! Learn more about Rainbow Rabbit’s Educational Programs here!